Yes! The meat with a hole! And that is exactly why I like it. 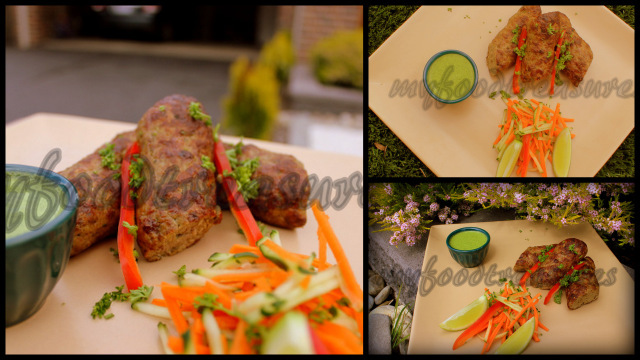 Not because it is boneless, but because it has a hole in it - the Seekh Kebab. Seekh Kebabs can be made with any minced meat but I always vote for minced lamb - even when lamb is not one of my favourite meats; or at the very least minced goat meat/ mutton.Seekh Kebab originated from Persia and folklore has it that it was a dish invented by Persian soldiers by using metal swords to prepare meat over open fire. Another story is about the invention of cooking methods using very little to no water due to scarcity of water in the deserts; this giving rise to cooking meat in different ways directly over fire. Traditionally, for Seekh Kebab, minced meat mixed with herbs and spices were shaped in the form of sausages around the metal skewers (Seekh) and grilled over extremely hot fire; the metal skewers were then removed before serving, thus creating the meat with a hole! Different recipes call for different cuts of meat, but I personally think that lean meat should not be used for Seekh Kebab. For the best texture and taste, use minced meat that has fat in it and use thick metal skewers for properly cooking meat from inside as well. I have used metal skewers for this recipe. Though nowadays, wooden skewers are easily available and usually people resort to using it; however the taste and texture are definitely compromised here. A little note to those who are using wooden skewers - soak skewers in water for at least 1 hr before shaping meat mixture on to them. This will prevent skewers from burning. This recipe works as a treat on the rotating grill section of the barbecue as well. Please read introduction before working on this recipe. 1. Mix all ingredients except for minced meat, yoghurt and bread crumbs. In a food processor or a grinder (using meat blade), process a handful of meat with these ingredients until just mixed. Then mix the meat,spice and herb mixture with the rest of meat, yoghurt and bread crumbs. Cover with a plastic food wrap and leave in refrigerator to marinate for at least 2 hrs for flavours to infuse. 2. Pre-heat oven on grill setting, to the maximum allowable temperature (I set my fan-forced oven at 250°C) with the metal skewers. When skewers are hot, take a ball of the meat mixture and press it on the skewers to form the shape of sausage. Repeat till the skewers are full. Baste kebabs with oil using a brush. Place under grill and cook on one side for 6 - 7 minutes (meat turn brown in colour). Flip skewers to the other side, baste this side with oil and continue to grill for 3 - 4 minutes or kebab is brown in colour. Gently remove kebabs from skewers, sprinkle with fresh lime juice and serve with green yoghurt chutney. Perfect starter....Delicious!! Awesome mouthwatering presentation! Fantastic pics, looks so tempting and flavorful!